You are currently browsing the category archive for the ‘Event’ category. Merge Mashup, my grand experiment in taking the themes of this blog into the live setting happened last Tuesday night. 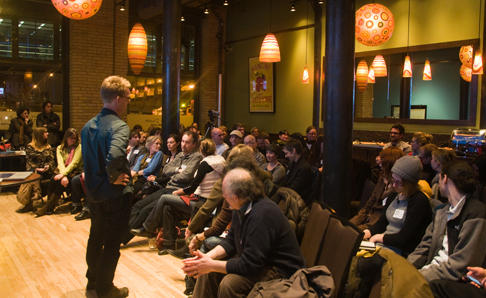 More than 80 designers and creative professionals packed into the Pizza Lucé Second Avenue Room in downtown Minneapolis to hear and participate in the stories of two dynamic young businesses: interactive agency Sevnthsin, and start-up micro-brewery Fulton Brewing Company. The atmosphere was casual and lively, the business stories were fresh and inspiring, and the crowd was engaged and insightful. Jamey Erickson, founder of Sevnthsin, led off the evening with his story of the agency’s very cool “Distance Makes No Difference” experiment where their entire staff hit the road for a two-week period. They traveled the country, visited clients and potential clients, and mixed up the rhythm of the workplace—tracking the whole experience online as they went. For Sevnthsin, DMND proved on one hand that the traditional notion of a workplace can be stretched to new limits, and on the other that face-to-face contact still has a powerful impact. 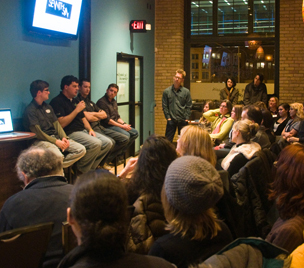 Brian Hoffman, Ryan Petz, and Pete Grande, three of the four founders of Minneapolis-based Fulton Brewing Company, shared their classic entrepreneurial tale (“gosh, maybe we should trying selling this stuff…”). It’s a “bootstraps” story filled with surprising insights that any aspiring entrepreneur would find inspiration in. Despite their “aw shucks” demeanor, these guys are smart businessmen who are building Fulton in a steady and methodical way. The next step in that growth will be the opening of their new brewery in the Minneapolis Warehouse district this coming summer. @AllieFairbanks #mergemashup Creative-business insight: In the absence of answers and money, there is creativity. Take the leap and figure it out. So, I had an absolute blast—the event exceeded my expectations, and proved my suspicion that a live event would be a great companion to the “pixeled” word. Special thanks to Jeremy Jones and The Foundation, along with AIGA Minnesota for their strong support of this event. Mashup #2 is already percolating—stay tuned. Announcing Merge Mashup: A Surprising Collision of Design and Business Ideas, a lo-fi, high-energy event that will blend an inspirational design story with a breakthrough business story to explore the new ways creative professionals can thrive in the current business environment. The inaugural Mashup will feature boundary-breaking Minneapolis interactive firm, Sevnthsin, paired with start-up microbrewery Fulton Brewing Company. Each guest will give a brief presentation, then the two will come together for an audience Q&A and discussion. Doug Powell, designer and curator of Merge, will serve as emcee and moderator of the evening. Merge Mashup is presented by The Foundation and AIGA Minnesota. Appetizers and a cash bar will be available. Space is limited; walk-up registration is not guaranteed. Advance registration is strongly encouraged.